One of my responsibilities as Web Literacy Lead at Mozilla is to provide some kind of theoretical/conceptual underpinning for why we do what we do. 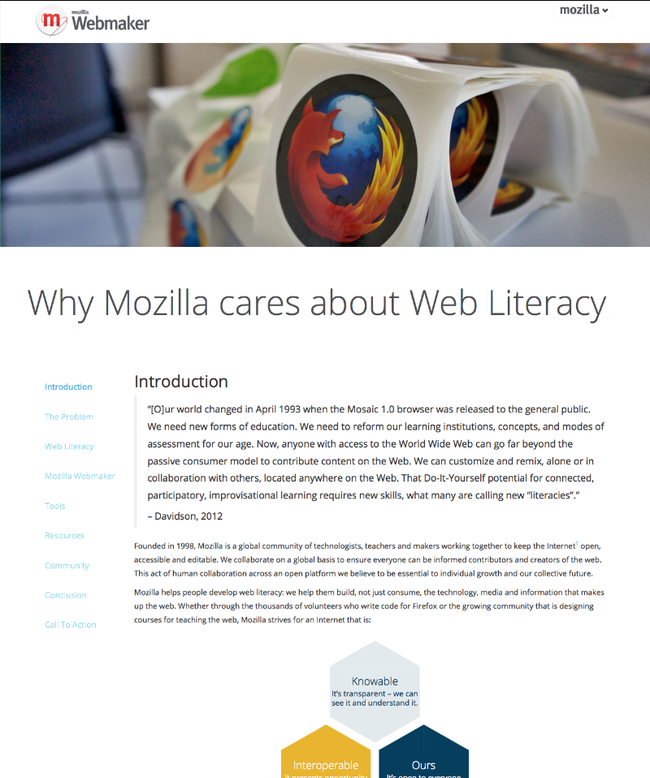 Since the start of the year, along with Karen Smith and some members of the community, I’ve been working on a Whitepaper entitled Why Mozilla cares about Web Literacy. The thing that took time wasn’t really the writing of it – Karen (a post-doc researcher) and I are used to knocking out words quickly – but the re-scoping and design of it. The latter is extremely important as this will serve as a template for future whitepapers. We were heavily influenced by P2PU’s reports around assessment, but used our own Makerstrap styling. I’d like to thank FuzzyFox for all his work around this! Thanks also to all those colleagues and community members who gave feedback on earlier drafts of the whitepaper. It’s available under a Creative Commons Attribution 4.0 International license and you can fork/improve the template via the GitHub repository. We’re planning for the next whitepaper to be around learning pathways. Once that’s published, we’ll ensure there’s a friendlier way to access them - perhaps via a subdomain of [webmaker.org](http:/webmaker.org). Questions? Comments? I’m @dajbelshaw and you can email me at doug@mozillafoundation.org.